The prestigious American magazine PassageMaker devoted no less than 18 pages of its 2001 June issue and a cover photograph to Linssen Yachts. The magazine's editor spent several days at the Linssen boatyard in January after attending the Düsseldorf Boat Show. 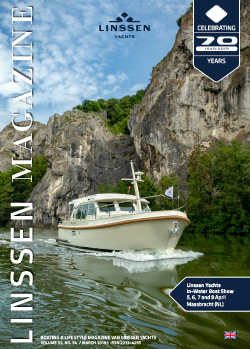 The result was a splendid article about the history, production and products of Linssen Yachts. Upon request we will send you the complete article. “...Linssen showroom is not typical of your average boat builder. Linssen Yachts is a brand that stands for quality. The inviting showroom, as part of the boatyard complex is another exponent of this quality. From the spacious Upper Deck, you have an excellent view of the showroom. Most of our pre-owned Linssen yachts are displayed in our Collection & Brokerage showroom. Here, you can inspect the yacht of your choice at your leisure come rain or shine. Six days a week you can view a selection of current models from the Linssen Yachts range at your leisure. Make an appointment with your Linssen regional representative. He will be delighted to accompany you to Maasbracht on your journey of discovery into the world of steel yacht building. The Linssen Yachts showroom … as unique as the brand itself.